Yes, I know Tailwind costs money. 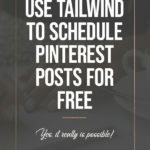 But yes, it really is possible to use Tailwind to schedule Pinterest posts for free. And I’m going to show you how. First of all, you probably already know the power of Pinterest. Pinterest is, by far, one of the most powerful marketing channels out there – especially for small businesses and freelancers. A lot of people like to dismiss Pinterest as just being another search engine, but I think its power lies in the fact that it is much more that just a search engine. There is still a social aspect that comes into Pinterest that you cannot get from other search engines. When Google pulls up its search results, you can trust that Google has found, through impartial algorithms and mathematics, the best posts to give you your answers. And that’s wonderful. But there is no connection on that search results page between you and the author of that website. That changes in Pinterest. The visual aspect of the pin, itself. The description you write into your pin. Colors, fonts, branding — each of these contribute to establishing a connection with a pinner before they even visit your your site. The downside to Pinterest, of course, is that it can take a lot of time to build up your account and get it to the point where you can command that kind of trust. In the world of social media, Twitter, Instagram, and Facebook are all sprinting over hurdles — but Pinterest is running a marathon. And like anything that takes a long time, Pinterest requires a lot of consistent effort and attention. Are you enjoying this article? Take a moment to pin this. You never know when you’ll need these tips again!! This is one of the reasons I love Tailwind to much. It helps calm the beast that is Pinterest. Or, at least, it helps make it seem less overwhelming. But, like any amazing tool out there — you get what you pay for, right? And Tailwind is amazing. Not to mention, worth every. single. penny. 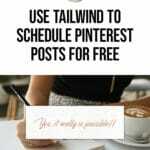 But, as a small business owner, Tailwind tends to be outside of our budgets — especially for new business owners, new bloggers, and new freelancers who haven’t even been able to create steady streams of income for themselves yet. So it’s really hard to justify the cost when you’re not sure if you can pay the price every single month… even if you know how much you need the tool. So, I want to put your fears to rest. I have been using Tailwind for free or nearly free for years. And getting this set up is not nearly as difficult as you might think it is. 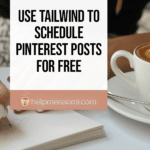 The First Step to Schedule Pinterest Posts for free: Get a Tailwind Account. Makes sense, right? If you want to be able to talk about how amazing and wonderful Tailwind is, then you need a Tailwind account so you can do just that. 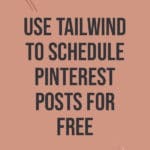 The good news is, Tailwind has an amazing free trial: 100 Pins. That’s right, 100 Pins. Not a week. Not 14 days. Not even a month. 100 Pins. How long will that last? Well, that’s up to you. If you use it to schedule one pin a day, it’ll be 100 days. If you use it to schedule three pins a day, it’ll last you 33 days and a little change. Trust me: take advantage of this free trial for as long as you can. 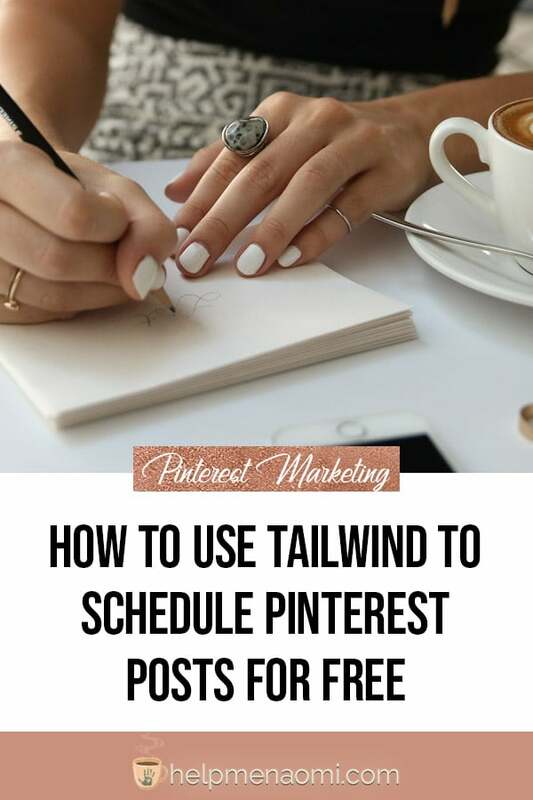 There are all kinds of things you can do with Tailwind while you’re on the free trial that can help you grow your Pinterest account. So don’t be in a rush to get off the free trial right away. Get to know Tailwind and some of the amazing features that it has that can help you. Then, when you’re ready, go ahead and schedule out your pins and upgrade your account to Plus. As soon as you sign up for Tailwind, you’ll see they have two options for sharing the love: a generous referral program and a generous affiliate program. The referral program is fairly straight forward. You are given a link to share, and if someone uses your link to sign up, you each get a $15 credit (good for one month of Tailwind Plus). So you can imagine how quickly those free months can rack up, right? All it takes is a few well-written blog posts, a couple reviews, and regular sharing on social media and in communities and you can rack up the credits. Step Three: Create a Tribe on Tailwind and Invite Your Readers. Tailwind Tribes is one of the most amazing features on Tailwind. It’s a community group within Tailwind of like-minded pinners looking to exchange content. You share your best posts in, and members of the tribe will queue them up and schedule them to go out to their Pinterest boards. In exchange, you schedule their content to go to your boards. It works out well because Pinterest loves it when people share pins from other pinners. In fact, you want roughly half of your posted pins to be from other people’s content. This ensures fresh, useful content that Pinterest users will love, keeps the Pinterest platform moving and updated, and just makes you look like a darn good pinner and friend. The best part is, you can invite anyone to join Tailwind tribes — they don’t even have to be on Tailwind!! And if they aren’t already a member of Tailwind and they click on your link to join your tribe — your invitation acts like a referral link and you both get a $15 credit!! Just as before, some well-placed invitation links, some blog posts reviewing the Tribe, and you can really rack up the free months. Tailwind‘s referral program is top notch. Definitely one of the best I’ve seen on a social marketing tool. Partially because it is so darn easy. But, if you are more into earning commissions rather than merely account credits (or if you’ve got more free months racked up than you know what to do with), Tailwind has a generous affiliate program you can apply to join as well. To join, first you have to be a member of Share A Sale. Share A Sale is an affiliate network that works with hundreds of brands. And it’s free to sign up and apply to any of the affiliate programs in there, so you want to join them anyway if you haven’t already. Once you’ve joined Share a Sale, search for Tailwind and apply to join their program. To be completely honest, I signed up for their affiliate program a long time ago, and I don’t remember exactly what they ask for in their application. But most merchants ask for you to explain how you will be promoting their programs, such as on a blog or via social content. It wasn’t hard to get approved, and if I remember correctly, the approval came in pretty quickly — like a couple days. Now, here’s the great thing about the affiliate program: it’s a 15% recurring commission. That means that if someone signs up for a monthly subscription through one of your affiliate links, you get paid 15% of their monthly fee every month. Now, you might be thinking “but… 15% of $15 is only $2.25… I get more with the referral program.” And all I can really say to that is you’re right. But, the $15 referral credit is a one-time credit applied to your account. The 15% commission is a recurring commission deposited right into your bank account every single month. And, if the people clicking on your affiliate link are signing up for some of the other amazingness that is Tailwind, such as content discovery and SmartLoop, then your commission will be higher than the $2.25. Could your clients benefit from Tailwind? My clients aren’t done working simply because I’ve finished their writing. Once my part is done, they have to go out and actually promote that writing — whether it was a blog post, an ebook, or a novel — they need to promote it. What better way to help them get the tools they need to promote that writing than by recommending a tool like Tailwind? And not only that, but think about how many other freelance writers, editors, and small business owners you have met since launching your business? How many groups are you in that are filled with freelancers? Could any of them use Tailwind to promote their services? Now, I am not saying to go hopping over to Facebook and start spamming your referral and affiliate links all over the place. That would be insane, it would get you flagged, and might even get you kicked out of the groups you’re in. But having those blog posts ready to share when someone asks a question about how to use Tailwind? Golden. Posting onto your Business Page on Facebook every once in a while to help new freelancers out? Golden. You can even include the links in your email marketing strategy and send it out to your subscribers. Or post a tutorial on YouTube and include the link in the description. The most important part about sharing your links is to do so with value and with the genuine interest in helping someone else. You don’t just want to beat people over the head with your Tailwind referral and affiliate links. Provide value and share your knowledge — aim to help someone rather than aiming to close a sale. And you’ll soon see those free months and those commissions building up for you.